We’ve been cycle camping a few times now. Philippa bought a cheapish tunnel tent (a Blacks Octane 3) a few years ago to try out cycle camping and this has served us well so far. It survived camping in a swamp for a few nights and has generally been fine. However, it does have some drawbacks, which I will outline below, and as all good equipment geeks will know, there is an eternal quest for perfection. With this in mind, we decided to upgrade our tent even before we’d decided upon this trip. It seems that upgraded tent is now going to get a lot of use! What were we looking for? Well there were a couple of things we wanted to keep the same, and a couple of things we wanted to improve upon. We still wanted a tunnel tent, as we liked the amount of space within the porch to store numerous panniers. We still wanted a three-person tent (as we all know that tent sizing is based upon the sardines in a tin approach to sleeping and Philippa, not being very cuddly, likes space when it comes to sleeping). However, we wanted more ventilation (we end up with a lot of condensation inside the Blacks tent), ideally a second door, an insect mesh on the entirety of the inner tent door, and we wanted a tent where both ends of the poles fit into grommets (unlike the Blacks tent where one side just sits in a pocket and has a habit of slipping out leading to sag). We know quite a few people who cycle camp extensively and a lot of them recommend the Hilleberg Nallo 3 GT and so this was an obvious place for us to start our search. We both agreed that this tent would meet all of our needs. 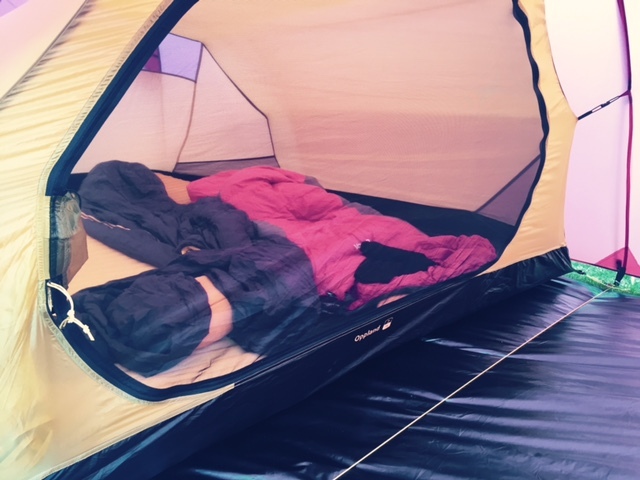 However, we had heard of some zip-related issues and simply could not face spending nearly £800 on a tent that would require us to meticulously clean the zips with a toothbrush on a daily basis. We searched around for other similar options and came across the Nordisk Oppland 3 tent, which seemed to be a fairly close fit for our requirements. It is a tent that comes with different fabric and pole options so that you can pick the weight of tent most appropriate for your needs (and budget!). It looked pretty impressive in a wind test! (note: I really hope we never have to camp in anything like those conditions). We opted to go weight weenie and went for the LW model, which is the lightest model coming in at under 2kg. This is seriously lightweight for such a large tent. We decided to also purchase a footprint, just because, with the total bill coming to around 50% of the cost of a Hilleberg with footprint. The LW model did mean that we had to sacrifice the second door, but as we found in our test last weekend, this was not an issue at all. 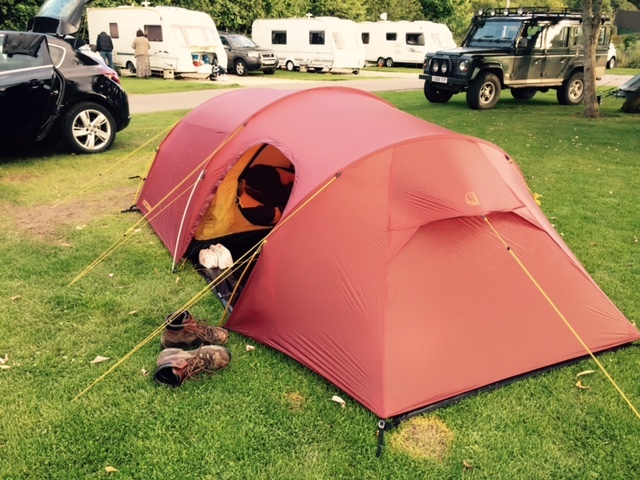 We took our new Nordisk tent up to Scotland at the end of August for a spot of hiking and we absolutely loved it. It is like a tardis; despite being only slightly bigger than the Blacks, it was huge inside – almost too big. This could easily sleep 3 people without disturbing Philippa’s need for space. We can both sit up inside, AT THE SAME TIME. We barely even noticed the lack of second door. We love the footprint, which opens up the porch as a viable place for us both to sit if the weather isn’t ideal, and makes middle of the night exits possible without ending up with squelchy knees from the wet grass. Our feet come nowhere near to touching the end of the inner – even Adam at 6ft tall (a problem with the Blacks that often led to damp sleeping bags in the morning). I think we will spend many happy hours in our new second home. ← A one-way ticket…to back home?